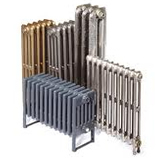 Period Style stock the full range of Bloomsbury Cast Iron Radiators in a series of heights as manufactured by Cast Iron Radiators in North Yorkshire. 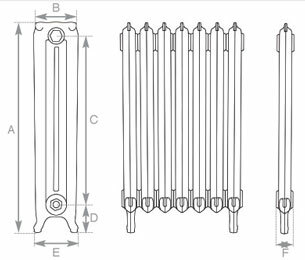 These traditional cast iron radiators are a slender elegant adaption of Rococo Cast Iron radiators or Baroque Cast Iron Radiators. Originally manufactured in Europe in the 1890s, the Bloomsbury became popular in traditional property owners who wanted more decorative cast iron radiators, this casting features elegantly scalloped top detail with interwoven decoration. Delivery is made using a pallet service, the average delivery time is subject to your choice of finish. To confirm our present delivery time please call us on 01723 321 333.